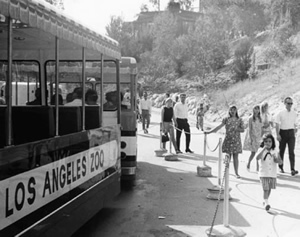 The Texas mini-bus was built for the Los Angeles Zoo and used as a people mover during the 1960s. Only a couple hundred of them were made before the company went out of business. 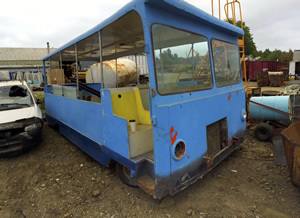 In 1971 the tram was sold to a real estate company on the Oregon coast where they used it to move people around to look at potential lots to buy. It broke down after just a few years of use and was abandoned in a shed for decades. 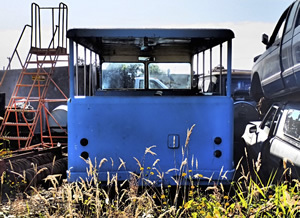 In 2015 it was towed to a scrapyard where it was going to be scrapped and recycled. I just happened to be at the wrecking yard the day it was going to be destroyed. I looked at it and said, "wait I need to save it, it's too cool." Repainted fire engine red with new spark plugs and a distributor, it fired up and received a name. The Glam Tram has a tasty sound system, disco lights and of course, a fireplace for the cool evenings. 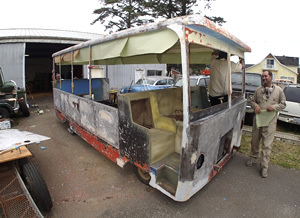 Already becoming iconic in Astoria, the tram is on the wish list for weddings, birthday parties, pub crawls, historical and haunted house tours. Its even transported a toga party. The Glam Tram has participated in raising thousands of dollars for charities and non-profit groups, being used as a transportation vehicle or sold as an auction item for groups like, Doernbecher Children Hospital, Dark Arts Festival, Clatsop Animal Assistance, and many small non-profit groups as well.